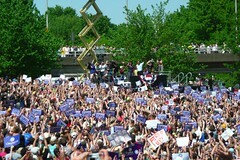 I've waited way too long to post these photos of the Obama rally. Obama came to Portland on May 18th and me and my friends were some of 75,000 people who waited in line for hours to see Obama speak. The line literally went for miles and wormed it's away around the city. It took us 20 minutes to find the end of the line. When we got to the end, we stood in line for 2 hours. But by the time we got to the rally the energy that Obama gave off was exhilirating. It actually brought tears to my eyes. He's not a mud slinger or a liar, he's the underdog with new ideas, solid ideas that could change America. It's time for a change... and I hope it's him.